In an era where local governments and municipal leaders are embracing the need to address climate change, the movement for 100% clean energy cities, businesses, and school districts is gaining momentum. In the last several years, nearly 100 cities (and counting) have committed to 100% clean energy, as have major companies like Apple and Google. 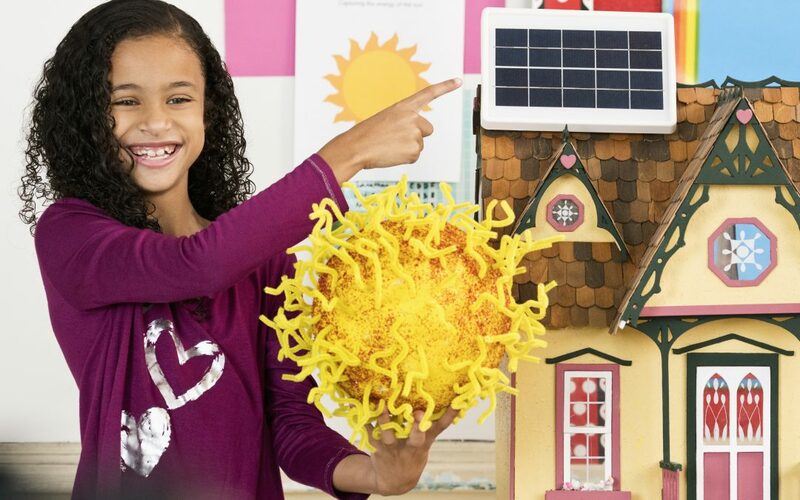 We believe that school districts are an important frontier for those working to transform our society to 100% clean energy because they are major municipal energy consumers, and because America’s youth will benefit from learning about the viability of this essential climate solution. K-12 schools produce a large amount of carbon pollution from fossil fuels – the carbon emission equivalent of 18 coal-fired power plants. Yet, schools are also well positioned to be inspiring leaders in our clean energy transition. American K-12 schools switching to 100% clean energy would be like taking one in seven passenger cars off the road—they can stimulate much broader mobilization in communities across the country. Cost savings. Energy efficiency alone can save U.S. school districts upward of a quarter of their energy costs, $2 billion per year. Student health. Clean energy upgrades including HVAC upgrades and repairs, lighting changes, and moving to clean stoves in cafeterias can tangibly improve student health. Academic performance. Student achievement is significantly improved by improvements in thermal control, ventilation, lighting, and air quality, all of which can be provided through efficiency and clean energy upgrades. Greater equity. Low-income students and students of color suffer disproportionately from asthma, which is aggravated by poor building conditions. These communities also suffer disproportionately from climate-related health impacts. Climate change mitigation. School districts can offset their significant energy-related climate impacts with a commitment to 100% clean energy. STEM and sustainability education. New opportunities for students to learn about clean energy and energy efficiency technologies and their benefits. Community resilience. Combining solar and batteries to “island” schools as energy self-sufficient locations for community shelters during disasters assists communities in navigating climate impacts. While American school districts still have a long way to go in realizing 100% clean energy, schools at the leading edge of the movement provide important insight regarding available pathways. Here, we highlight the efforts of two school districts in different parts of the country—a small suburban district and a large urban one—working to achieve 100% clean energy: Red Wing Public Schools in Minnesota and San Francisco Unified School District (SFUSD) in California. It’s important to emphasize at the outset that the expression “it takes a village” is true when it comes to moving school districts to 100% clean energy. To achieve this goal, there is usually a combined effort on behalf of school officials, parents, teachers, and students who are motivated to move in this direction. Sparked in part by 2013 solar jobs legislation, Minnesota has become a shining light for school districts across the country. It’s estimated that about two dozen school districts across the state, such as Annandale, Chisago, St. Cloud, and Columbia Heights, are powered by 100% solar energy, with a majority of these being accomplished through community solar arrangements. Red Wing Public Schools achieved 100% clean solar energy for its seven schools through their Red Wing Community Solar Garden, commissioned in 2016. The district installed a six-megawatt solar array on a parcel of land they owned adjacent to a school. Through 25 years of operation, Red Wing Public Schools—which serves about 2,800 students—is set to save approximately $6 million in energy costs and generate an additional $1 million in lease revenue from other customers who receive power from the project. Red Wing was not required to capitalize the project upfront nor maintain the project over its lifetime. The district contracted with an installer, IPS Solar, in an arrangement similar to a power purchasing agreement, whereby IPS Solar shoulders the costs for development and provides discounted electricity rates to the school district. IPS Solar carried out this project as part of a wider Solar4Schools program that serves many districts in the region. IPS Solar developed and implemented STEM curricula tied to the solar project, and community ties were improved since excess power is supplied to residents and the City of Red Wing. One unusual benefit of this particular project comes from the decision to plant pollinator-friendly species between the rows of solar panels, allowing the district to do its part to address the growing pollinator crisis. SFUSD demonstrates how an ambitious, holistic plan to eliminate a large school district’s climate impacts can be systematically implemented while bringing a range of added benefits. SFUSD has long counted hydropower as one of its energy sources; however, the district is now working to produce all its power on-site, in addition to tackling a variety of other sustainability initiatives. SFUSD has been working to increase its sustainability for over a decade. In 2017, the district passed a Resolution in Support of Carbon Neutral Schools, formalizing their ambitious goal of becoming carbon-neutral districtwide by 2040. Through its Carbon Reduction Plan, SFUSD – which serves 55,600 students in 136 schools – is on track to phase out fossil fuel use by 2040, generate all its power on-site by 2050, eliminate all gas usage by 2040, and undertake a range of other measures, such as dramatically reducing vehicle fleet emissions. As these two projects’ different strategies suggest, there are many pathways to a 100% clean energy future for school districts. We spent the last year researching the specific pathways school districts can take to achieve 100% clean energy and produced the 100% Clean Energy School Districts Handbook, which is full of resources to support school districts in finding the approach that works best for their particular geographic, political, and financial context. Eric Pasi, Chief Development Officer at IPS Solar, the company that helped Red Wing Public Schools achieve 100% clean energy, told us in the course of research that to help build the requisite momentum to make 100% clean energy school districts a reality around the country, it’s important for school district stakeholders, such as parents, students, and teachers, to get involved. His advice aligns with the goal of our handbook, which is to spur a large national, multi-stakeholder effort to transition school districts to 100% clean energy. Sierra Club’s Climate Parents and Ready for 100 programs are heading up an effort to pass 100% clean energy school district resolutions. An ally in this effort is Generation 180, which works to solarize schools. If you’re interested in getting involved, please contact us at info@climateparents.org. Katy Mamen, MS, is a systems change consultant who has been working with Climate Parents’ 100% Clean Energy School Districts campaign. She supports organizations and groups around the country in building effective strategies and collaborations to bring about lasting social change. Katy is also a Fellow of the Academy for Systems Change. Lisa Hoyos is the Director of Sierra Club’s Climate Parents program. She has spent more than two decades working on labor and environmental advocacy. She also worked as a legislative analyst on the California Senate Natural Resources Committee. She is a member of the San Francisco Commission on the Environment and serves on several nonprofit boards including the Alliance for Climate Education and the California League of Conservation Voters. K-12 schools account for 7.7% of primary energy use in commercial buildings, that is 536 trillion btu out of 6,963 trillion btu (U.S. Energy Information Administration). 2015 commercial building sector CO2 emissions were 932 million metric tons (MMT) CO2 (EIA Monthly Energy Review July 2018), so K-12 schools were responsible for 72 MMT CO2. Note this calculation uses two assumptions: 1) that K-12 schools have similar geographic distribution as all commercial buildings; and 2) that K-12 schools’ proportion of energy use among fuels (electricity, natural gas, oil) is roughly similar to the average of commercial buildings (checked using CBECS microdata which looks at number of buildings in the CBECS sample that use the various fuels). Emissions equivalencies calculated using EPA greenhouse gas equivalencies calculator. U.S. Environmental Protection Agency. (2011). Energy Efficiency Programs in K-12 Schools: A Guide to Developing and Implementing Greenhouse Gas Reduction Programs. U.S. Environmental Protection Agency State and Local Climate and Energy Program. https://www.epa.gov/sites/production/files/2017-06/documents/k-12_guide.pdf. See for example, Mendell, M.J. & Heath, G. (2004). A Summary of Scientific Findings on Adverse Effects of Indoor Environments on Students’ Health, Academic Performance, and Attendance. Prepared for U.S. Department of Education Office of the Under Secretary. http://www.ncef.org/content/summary-scientific-findings-adverse-effects-indoor-environments-students-health-academic. See for example, Heshong Mahone Group. (1999, August 20). Daylighting in Schools: An Investigation into the Relationship Between Daylighting and Human Performance. http://h-m-g.com/downloads/Daylighting/schoolc.pdf. Eric Pasi, IPS Solar, Personal communication, January 25, 2018.